What’s Wrong with Patrik Laine? Nearly all snipers are streaky, but Winnipeg Jets star Patrik Laine (35 points in 52 games) is taking this a little too far. Since his ridiculous 18-goal eruption in November, he’s found the back of the net four times in 28 games. On Saturday night, his team obliterated the Anaheim Ducks 9-3 on the strength of six different scorers. It was the perfect moment to get the monkey off his back, yet even with the floodgates open, he mustered all of one secondary assist on the power play. For a career 16.9% shooter, his 2018-19 conversion rates by month are baffling: 6.8, 33.3, 7.9, 2.6 and 0. Obviously, he’s neither as clinical as his high nor as hopeless as his low, but considering his current performance, just where he fits between those poles is unclear. Oddly enough, the Jets are riding a 20-8-0 run during Laine’s dry spell. Their stellar top line, solid defense and next-man-up philosophy have carried them to victory of late, but if they hope to make a dent in the playoffs, they need to get their 20-year-old sharpshooter back on the right track. Mark Scheifele (62 points in 52 games), Blake Wheeler (64 points in 52 games) and Kyle Connor (42 points in 52 games) can’t carry the offense by themselves. As it stands, factors both within and beyond his control are hampering his production. 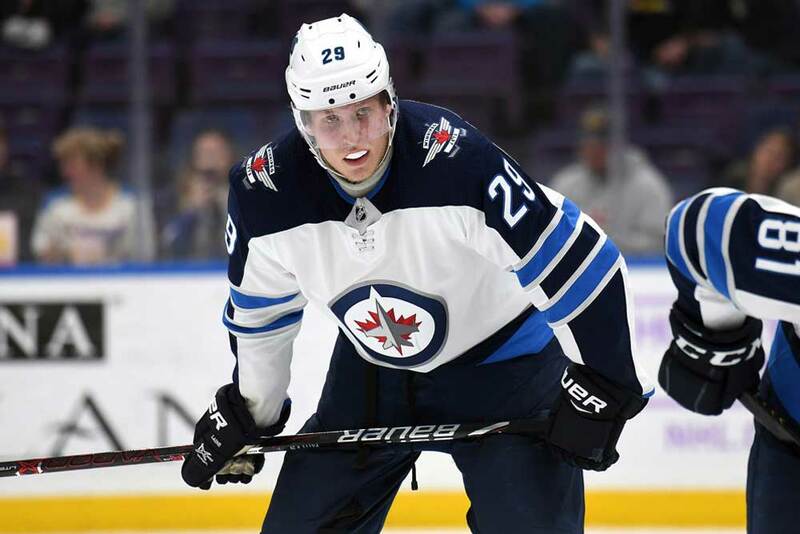 First off, head coach Paul Maurice has paired him with a center who may not be capable of maximizing Laine’s skill set. As an effortless finisher, he requires a pivot who can consistently put the puck in his wheelhouse. Otherwise, he’ll merely wait for the play to come to him. On a line with Bryan Little (34 points in 52 games), that approach is proving quite frustrating. The 31-year-old remains a serviceable veteran, but there’s a distinct lack of chemistry at play because Little is more of a jack-of-all-trades than a slick setup man. That’s not the formula for a successful partnership, so their awful numbers together aren’t exactly surprising: The Jets control just 44.3% of the shot attempts, 45.8% of the scoring chances and 43.4% of the goals scored during their 5-on-5 shifts. Since Laine’s NHL debut in 2016-17, he and Little have posted a 46.8 CF%, 47.4 SCF% and 46.3 GF% on a competitive team. In other words, this isn’t a shocking development. When Laine has played with any other center — mostly Scheifele — his line’s GF60 has risen from 2.64 to 3.55. Curiously, though, that isn’t the case this season, as his GF60 drops from 2.76 to a dismal 1.47 without Little. The veteran’s numbers also skyrocket (56.5 CF%, 54.2 SCF%, 50.0 GF%) away from Laine, which suggests there’s more to the youngster’s issues than Maurice’s line combinations. Without pucks handed to him on a silver platter, he’s struggling to contribute much of anything. If he wants to shed the skin of an inconsistent scorer, he can’t sit back and let his centers shoulder the entire burden of creating opportunities. Sure, his shot is world-class and without question his greatest gift. However, it’s not his only gift. He’s seemingly labeled himself a one-trick pony and is relying on that incredible skill to shine through. Unfortunately, he’s suffering from tunnel vision when he is granted touches. Instead of surveying the play and picking the best option available, he’s either shooting as soon as he can or holding on to the puck for an eternity as defenders bear down on him. He’s flashed a deft passing touch and the ability to shield the puck in the past, but he’s seemingly tucked those skills away while he waits for his best asset to normalize. To be fair, his shooting percentage will likely rebound to a respectable mark soon enough. In the meantime, however, he needs to use his teammates and move his feet to loosen up the opposition’s posture. A slumping, stationary target isn’t scaring anyone or doing his teammates any favors. His line is a one-and-done machine at the moment, which only accentuates Laine’s weaknesses as a three-zone player. He’s now forced to chip in without the puck…and it isn’t going swimmingly. In fact, Winnipeg drowns in just about every metric during his time on ice. He ranks dead last among Jets forwards in CF% (45.6), SCF% (46.3) and GF% (42.2). Among the 250 NHL forwards who have played 500-plus even-strength minutes this season, Laine comes in at 243rd in relative CF%, 229th in relative SCF% and 238th in relative GF%. He isn’t just snake-bitten. The Jets never control less of the play than when their third-year sniper hops over the boards. If he can’t contribute on the scoreboard, he should help his team out in other ways. His sorest spot at present is his play along the defensive blue line. He’s struggling to ensure that his team exits its zone cleanly with link-up passes or chips out into safe areas. That’s as basic as it gets for a winger, yet he isn’t executing. It’s hard to earn the coach’s trust when you can’t nail down the fundamentals. As odd as it may seem for a 6’5”, 206-pounder, physical limitations may be holding him back as well. There’s no power whatsoever to his first few strides and he doesn’t possess the strength that he should with his frame. He regularly loses leverage in the corners to smaller opponents and isn’t explosive enough to create separation. As a result, he isn’t finding himself in advantageous situations all that often. Little is an easy scapegoat — and Maurice is partially responsible for staying the course — but Laine has actually posted his highest shots/60 yet in 2018-19. The problem is he’s settling for low-percentage bids instead of taking the play into his own hands to generate dangerous chances. While management can sort his physical flaws out in the offseason with a stricter and more focused workout regimen, for the time being, he’s an awkward, lanky scorer who’s lost his way. The Jets can’t afford to hope that Laine’s shooting percentage bounces back on its own. Given his two-way issues, they can’t jeopardize their top unit by placing him next to Scheifele either. For his part, Laine can’t spend his time floating around the perimeter and firing pucks indiscriminately. He needs to work with what he has physically and engage in the action. He’s done so over the past couple of contests, and while it hasn’t led to goals yet, that extra bit of urgency will help him turn the tide. It’s just a matter of avoiding the shortcuts and trusting the process. In the end, streakiness may well define his career. It’s not uncommon for pure scorers to experience the occasional drought. However, this is different. A dubious partnership, growing pains and insufficient drive have conspired to bring his offense to a dead stop. He’s hit a wall and seemingly has no idea how to work through it. It starts there, really: Work. Only then might we see the flip side of this coin. Though he’s ice-cold now, few stars in the world can burn hotter.